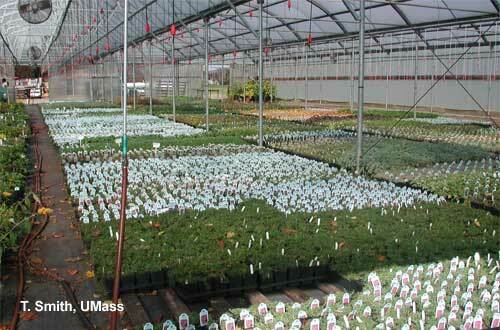 The key to overwintering is to maintain even temperature, keeping the plants cold and alive but not actively growing. 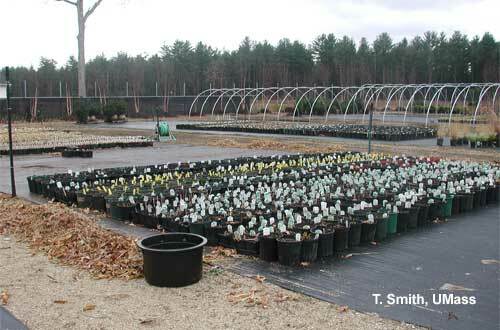 When plants are allowed to freeze and then thaw, there is a greater risk for plant loss. The degree of winter protection should be based on the expected minimum temperatures at a particular site and the root hardiness (the lowest temperature at which roots survive) of species being grown. Root and crown hardiness have only begun to be identified for herbaceous perennials by researchers. Until root hardiness is identified, growers have no choice but to take steps to avoid losses of plants. See Table 1  for a list of perennials and root media temperatures. The final step prior to covering plants is to provide some type of rodent control. Many growers use commercially available baits while others have reported that human hair or cut up deodorant soap works for them. Fact sheet on rodent control . Pilon, P. 2016 Ravaging Rodents. Perennial Pulse, Ball Publishing. Jan 26 issue. Pyle, A. 2011. Perfecting Perennial Production . Greenhouse Management Magazine. August Issue.